2016: New Words, New Goals, New Spots! Greetings my little filet minions (see what I did there)! Now that we are almost one month in to 2016 there is so much writing to do! And I am here to help push you (and myself hopefully) toward more words for the year. Not just more words in terms of quantity, but more words in quality as well. Well, Spotted Writer….Mistress, how are you going to do that? We’re all over the world. You cannot possibly help ALL of us write more and write at the quality we want from behind your computer. I can with prompts. I know, I know. I keep talking about them, but I’m convinced that if I show you their benefits, you will eventually come to love them like I do. As a reminder I will be accepting submissions to be published on my blog for the January prompts. There’s no word count minimum or limit. It can be poetry, non-fiction, fiction, stream-of-consciousness monologue. Whatever you feel like writing. Listed below are the prompts given at the end of December. Feel free to simply use them for another time. I will be posting February’s prompt by the end of the week, so look out for the new story ideas I’ll be posting. Hint: there will be a theme for two very special events this February! Here are the three selections for this month, which all come from Awesome Writing Prompts. Disclaimer: I was obsessed with poetry in middle and high school, but I soon found my lines/verses too long and switched to prose. I love these poems, but I don’t think I have the ability to write with few words and say a lot. Anyway, here are some of my favorite poems that I’d like to share with you. 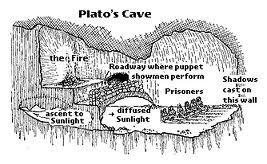 Socrates describes a cave where prisoners are kept chained and facing a wall with a fire behind them as the only light. Their entire world is understood by puppeteers creating shadows on the wall in front of them. They believe the “reality” in front of them without question and that is all they know. One prisoner escapes to find his entire perception of reality is incorrect. He sees what has been making the shadows on the wall, and his eyes are opened by light of the fire. He attempts to convince the other prisoners of the true reality, and they do not believe him because it is much easier to continue what they have always believed. The escaped prisoner climbs out of the cave into the full illumination of the sun, and recognizes the true forms of people and things under the light of the sun. He once again descends to the cave to inform the prisoners of his discovery. He is laughed at for believing the ridiculous things the prisoners have yet to experience. He is the sole conscious of goodness, who must lead the prisoners out of the dark cave of ignorance and into the light of truth. Of the cave inside us all. Let me know your thoughts, but keep in mind these are old and haven’t been altered in a very long time. Also, I’m not a consistent poet, so I don’t practice often.